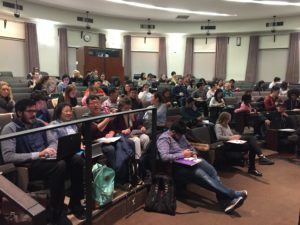 Every year I teach a virology course to undergraduates and masters students at Columbia University. I record video and audio of each of the twenty-five lectures and release them on YouTube – so that not only the students but the rest of the world can learn about the amazing field of virology. With the spring semester behind us, this year’s lecture series is complete (link to the entire playlist at YouTube). The first 11 lectures cover the fundamentals of virus replication, including virus entry into cells, genome replication, protein synthesis, and assembly. In the remaining 14 lectures we focus on how viruses cause disease, how to prevent or resolve infections, and viral evolution and emergence. All the lecture slides are also available as pdf files, as well as study questions for each lecture. You can find them at virology.ws/course. I plan to use these videos to revise my Coursera virology course – which is no longer online – by the end of the summer. Thanks so much for the compilation! The lectures by Professor Vincent Racaniello are brilliant!!! Thank you for making it available. Highly recommended. They really helped me understand many concepts while studying virology.